Nobody died during Day 1, but that was just the travel day. Now we have our full complement of old folks in our party, and it's not long before constitution and health levels are running low. I should have brought some health potions! 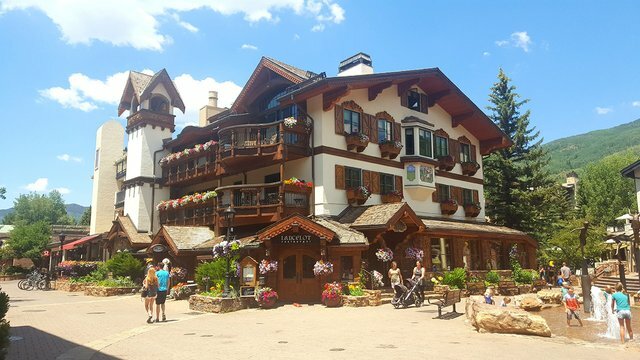 For our plans today, I wanted to visit Vail. 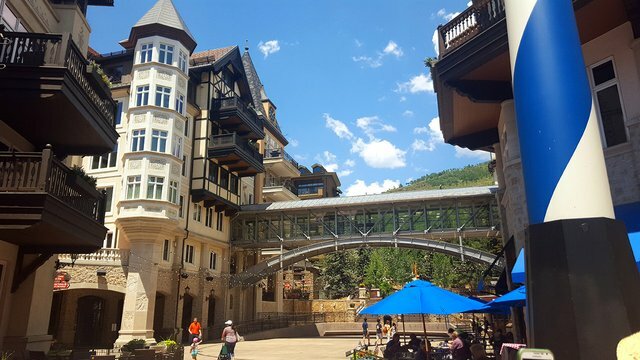 I've heard a lot about the ski village at the feet of Vail Mountain. Additionally, in Wisconsin we live at the foot of the largest 'mountain' in the state, Granite Peak. 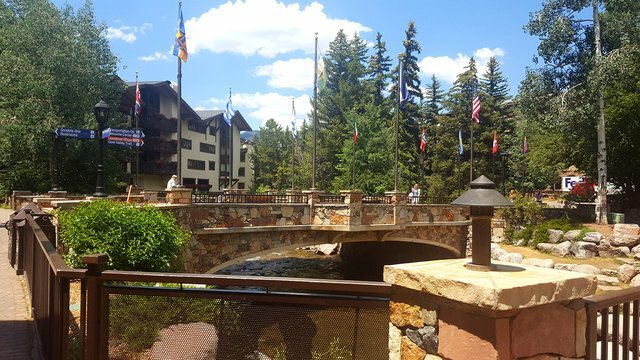 It's a ski hill too, but certainly nothing like Vail. As a web developer, I happened to have built the website for the Granite Peak Ski Area. So, in general, the ski area does try to copy the big ski hills in Colorado like Vail and Aspen and all that, and I actually wanted to see what the big deal was. Anyway, now that I've thought about business, this suddenly can be written off as a business research trip. Right? 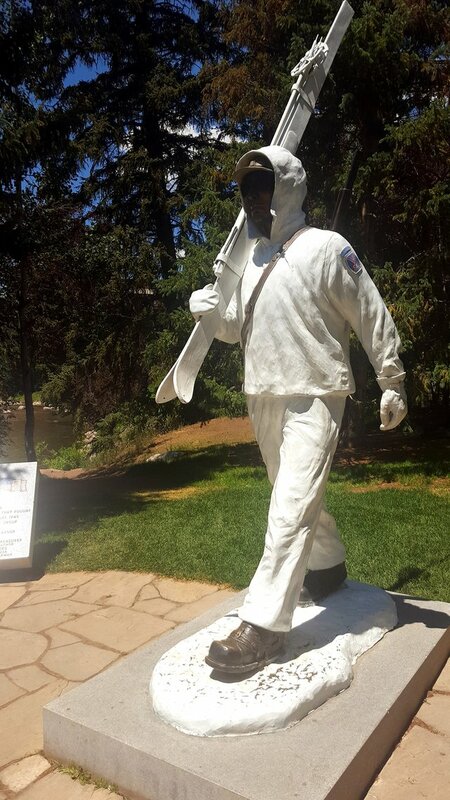 At the entrance to Vail Village they have a statue that is a tribute to the 10th Mountain Division. The 10th was a group of some 18,000 soldiers who trained in the mountains for the US Army during WW2. Afterwards, many of the veterans of this division went on to forming key parts of the emerging ski industry. Many of them mapped trails, became ski instructors, ski tech designers, etc. Pretty cool! Low on traffic, high on views. Lots of mountain bike rental stations. The ski hills are all open to mountain biking in the summer, with some pretty intense trails winding their way through the trees and ski runs. The two older ladies in our party are about to get sucked into that little Rajeunir store at the lower left. Some kind of fancy skin cream. They emerged about an hour later, some $800 poorer but with a small bag in each of their hands to represent their newfound power over wrinkles. 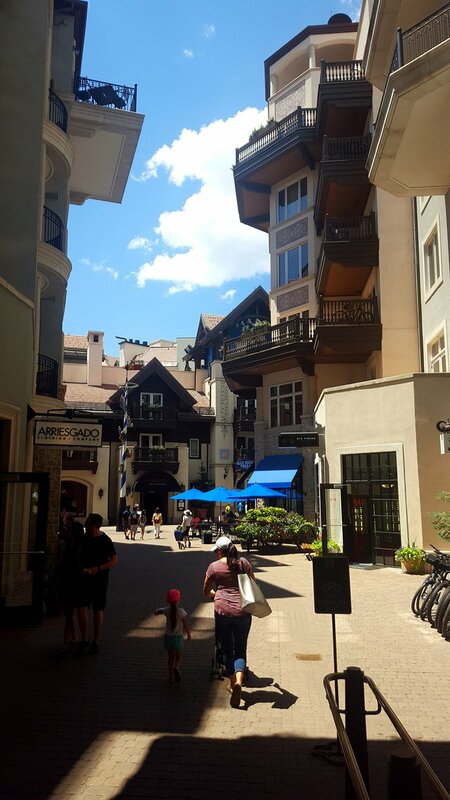 Most of the buildings are intentionally built in the style of a European ski village. I've never been to a European ski village, but I think they did a pretty good job. 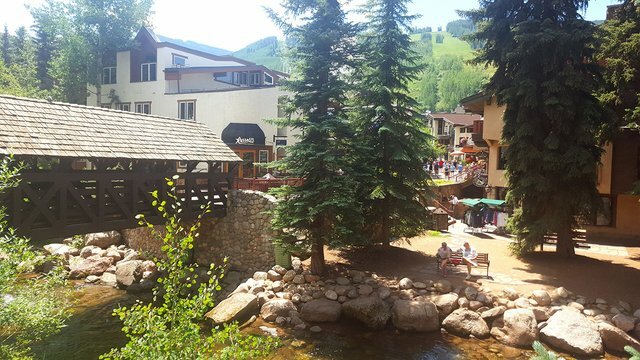 Little creeks and rivers run through Vail Village. Although the water levels are kind of low (rain has been scarce and it's quite hot), the snow runoff water is still quite cold. Following the creek through town. 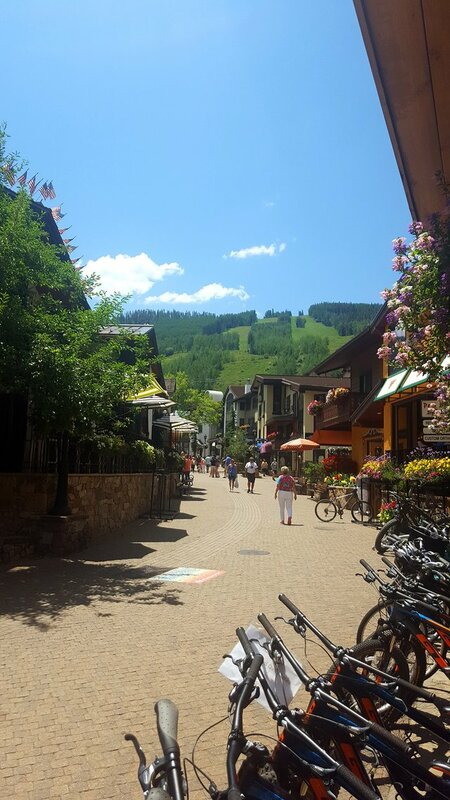 Most of Vail feels like a long strip that runs along the feet of the mountains. 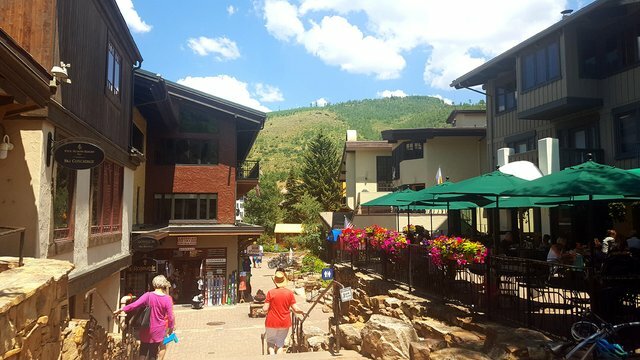 You can take a bus to go from Vail Village to Lionshead, which is the village to the west of Vail and contains more modern buildings and a different sort of nightlife. 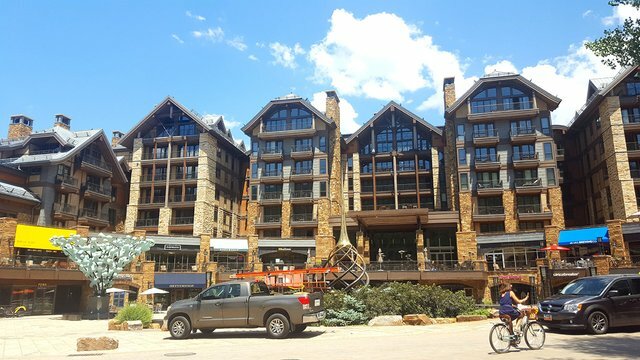 I prefer Vail Village, as some of the lodges and structures are pretty detailed. These has a definite Japanese feel to me, mostly due to the rooflines, but maybe it's a common style in Europe. The streets here aren't straight. Which is cool. It feels like the layout is truly organic, and wending your way through the streets is like being in an old Italian town. 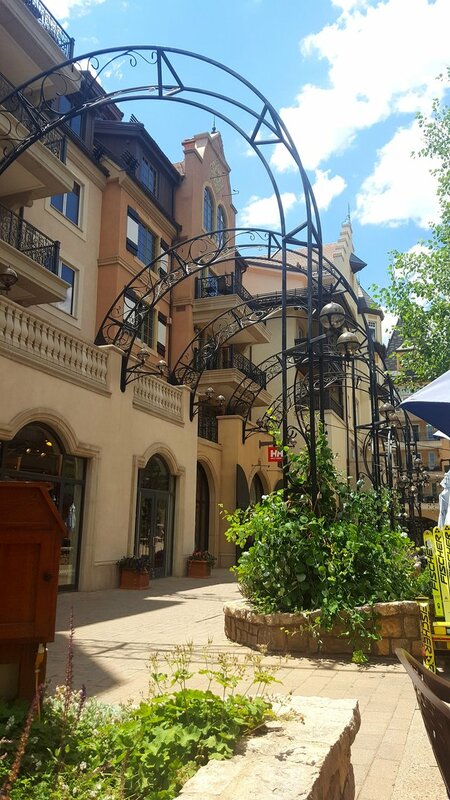 Little details are everywhere, including these fancy metal arches. Looks like they're trying to get some vines to grow up along it, but the vines are wanting no part of that. For as busy as the parking lot was, the Village itself is not so busy. I guess everyone is out on the trails and rivers, hiking and biking and rafting and whatnot. Our afternoon destination was the Betty Ford Alpine Garden. It was hard to find. As it turned out, it's hiding behind this giant lodge, Manor Vail Lodge. The entrance to the park was a little covered space between two buildings. 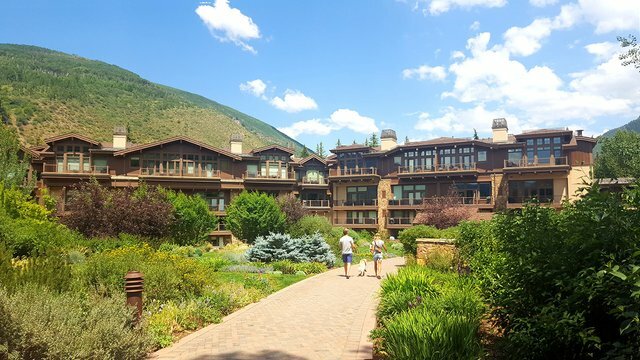 Well, we still have our full party at this point, but the elder gent with us is going to wait for us in the Manor Vail Lodge, while myself and the wife, her mother, and her aunt explore the Betty Ford Alpine Garden. Slow walking looking at flowers? Should give everyone time to recover their health. Thanks! I wish I skied too; probably those wishes would continue right up until I broke my leg in a freak skiing accident. Then I'd likely change my tune and wish I hadn't skiied. This place does look very European. I like it. I'm loving this "travelogue". When I was out in CO as a child, we went to Pueblo; also Pike's Peak. All I remember was that it was hot, hot hot - and tiring (probably the oxygen - or lack thereof - thing). It was super hot for us as well. Supposedly it never used to be that consistently hot in CO, but lately it's been very hot and dry. I think I'll avoid the winter in CO, thank you very much :) If I lived there I'd probably stay indoors all winter with a fire going. I think I'll be in Aspen this weekend. We should meet up! Still, the weather last week was great (hot) and sunny (no rain at all). Hopefully yours is just as good! Yes, it has been hot here - which is why we go up into the mountains! Sorry I missed you, though, Dr. Who. BTW, you're right about staying indoors with a fire in winter. When I lived in the mountains, we once had a six-foot snow which sort of forced that exact scenario on everybody. If you have a good enough accountant, sure. Years ago, I knew a guy whose daily cartoons were syndicated in a bunch of newspapers. Once a year, there would suddenly be seven cartoons in a row of a guy sitting on a tropical beach with a piña colada. Pete had just gotten back from vacation. Those seven cartoons were proof enough for the IRS that he had been on the trip for research purposes related to his business. Hiya, just swinging by to let you know that this post made the Honorable mentions list in the Travel Digest #268. Great pictures! It’s so neat that you built the Granite Peak Ski Area website. Must check it out.